Engagement of NKG2D and DNAX accessory molecule-1 (DNAM-1) receptors on lymphocytes plays an important role for anticancer response and represents an interesting therapeutic target for pharmacological modulation. In this study, we investigated the effect of inhibitors targeting the glycogen synthase kinase-3 (GSK3) on the expression of NKG2D and DNAM-1 ligands in multiple myeloma (MM) cells. GSK3 is a pleiotropic serine–threonine kinase point of convergence of numerous cell-signaling pathways, able to regulate the proliferation and survival of cancer cells, including MM. We found that inhibition of GSK3 upregulates both MICA protein surface and mRNA expression in MM cells, with little or no effects on the basal expression of the MICB and DNAM-1 ligand poliovirus receptor/CD155. Moreover, exposure to GSK3 inhibitors renders myeloma cells more efficient to activate NK cell degranulation and to enhance the ability of myeloma cells to trigger NK cell–mediated cytotoxicity. We could exclude that increased expression of β-catenin or activation of the heat shock factor-1 (transcription factors inhibited by active GSK3) is involved in the upregulation of MICA expression, by using RNA interference or viral transduction of constitutive active forms. On the contrary, inhibition of GSK3 correlated with a downregulation of STAT3 activation, a negative regulator of MICA transcription. Both Tyr705 phosphorylation and binding of STAT3 on MICA promoter are reduced by GSK3 inhibitors; in addition, overexpression of a constitutively active form of STAT3 significantly inhibits MICA upregulation. Thus, we provide evidence that regulation of the NKG2D-ligand MICA expression may represent an additional immune-mediated mechanism supporting the antimyeloma activity of GSK3 inhibitors. Glycogen synthase kinase-3 (GSK3) is a multifunctional serine/threonine kinase, first identified as a pivotal mediator in glycogen metabolism and insulin signaling and now considered as an important component of diverse cellular signaling pathways involved in the regulation of protein synthesis, cell motility, proliferation, and survival [reviewed in (1–3)]. GSK3 has emerged as one of the most attractive therapeutic targets for the treatment of different diseases, such as neurologic diseases (e.g., Alzheimer, stroke, and bipolar disorders), diabetes, and inflammation (3–5). Moreover, GSK3 holds promise for therapeutic intervention in several cancers due to its involvement in tumor development and chemoresistance [reviewed in (6)]. In this regard, different inhibitors of the kinase GSK3 have been recently studied for their ability to inhibit the proliferation of several malignant lymphoid cells. Multiple myeloma (MM) is a malignant plasma cell disorder characterized by latent accumulation of clonal secretory plasma cells in the bone marrow (7, 8). MM is an incurable disease with a median survival of a few years, recently improved by the introduction of new antimyeloma chemotherapeutic agents such as bortezomib and thalidomide/lenalidomide, and by the wider use of transplant procedures (7–9), in which part of the curative potential of allografts is attributed to a graft-versus-tumor effect mediated by donor lymphocytes (10, 11). In this regard, a number of evidences in myeloma patients strongly support the antitumor potential of NK cells in response to immunomodulatory drugs or following allogeneic stem cell transplantation (12–14), and several studies have shown that the engagement of the NKG2D and DNAX accessory molecule-1 (DNAM-1)–activating receptors plays an important role in the recognition and killing of MM cells by NK cells (15–17). Indeed, MM cells can express the NKG2D ligands MICA/B (15, 18), different UL16-binding proteins, and the DNAM1-ligands poliovirus receptor (PVR; CD155) and nectin-2 (19, 20). Studies on the expression and function of GSK3 in MM cells have reported an abundant expression of the two GSK3 subunits, α and β, and identified GSK3α as the prevailing active isoform. In this regard, it has been shown that inhibition of GSK3 can induce growth arrest or apoptosis in MM cell lines, and enhance the anti-MM cytotoxic effect of bortezomib, by modulating critical signaling pathways in these cells (21–23). Our laboratory has recently shown that low doses of different genotoxic drugs (e.g., melphalan, doxorubicin, and bortezomib) or inhibitors of the heat shock protein (HSP)-90 protein (e.g., 17-allylamino-17-demethoxy-geldanamycin, radicicol) can increase the expression of NKG2D and DNAM-1 ligands on these cells, via induction of the DNA damage response (DDR) or the activation of the heat shock factor-1 (HSF-1) transcription factor, respectively (19, 20). The upregulation of these ligands on MM tumor cells is associated with their ability to trigger increased NK cell degranulation. In this study, we analyzed the possibility that treatment of MM cells with different inhibitors of GSK3 could regulate the expression of NK cell–activating ligands and, in turn, modify NK cell recognition and cytotoxicity against these cancer cells. Our results indicate that the GSK3 inhibitors can increase the surface expression levels of the NKG2D ligand MICA on MM cells, without significant effects on the expression of MICB or the DNAM-1 ligand PVR/CD155. Moreover, we found that MICA upregulation correlates with an increased gene promoter activity and a reduction of the Tyr705 phosphorylation and MICA promoter binding of the transcription factor STAT3, a negative regulator of MICA transcription (24). In addition, inhibition of GSK3 could further enhance MICA expression levels in melphalan- or lenalidomide-treated cells, and significantly increase NK cell–mediated killing by promoting NKG2D recognition. Overall, our data demonstrate that GSK3 inhibitors can regulate NKG2D-ligand expression, suggesting a new role of these agents in improving immune response to multiple myeloma. The human MM cell lines SKO-007(J3), U266, and RPMI 8226 were provided by P. Trivedi (Sapienza University of Rome). The cell lines were maintained at 37°C and 5% CO2 in RPMI 1640 (Life Technologies, Gaithersburg, MD) supplemented with 15% FCS. All cell lines were mycoplasma free (EZ-PCR Mycoplasma test kit; Biological Industries). Bone marrow samples from patients with MM were managed at the Institute of Hematology (Sapienza University of Rome). Informed consent in accordance with the Declaration of Helsinki was obtained from all patients, and approval was obtained from the Ethics Committee of the Sapienza University of Rome. The bone marrow aspirates were processed, as already described (19). In some experiments, myeloma cells were selected using anti-CD138 magnetic beads (Miltenyi Biotec, Auburn, CA). More than 95% of the purified cells expressed CD138 and CD38. The 4-hydroxytamoxifen, radicicol, and the GSK3 inhibitors [2′Z,3′E]-6-bromoindirubin-3′-oxime (BIO), SB216763 (SB21), and LiCl were purchased from Sigma-Aldrich (St. Louis, MO). STA-21, a selective inhibitor of STAT3, was purchased from BIOMOL/Enzo Life Sciences (Farmingdale, NY). Lenalidomide was purchased from BioVision (Milpitas, CA). The following mAbs were used for immunostaining or as blocking Abs: anti-MICA (MAB159227), anti-MICB (MAB236511), and anti-NKG2D (MAB149810) from R&D Systems (Minneapolis, MN); anti-PVR/CD155 (SKII.4) provided by M. Colonna (Washington University, St. Louis, MO); anti-CD56 (C218) mAb provided by A. Moretta (University of Genoa, Genoa, Italy); anti–DNAM-1 (DX11) from Serotec (Oxford, U.K.); and anti-MHC class I (W6/32) from American Type Culture Collection (Manassas, VA). Allophycocyanin goat anti-mouse IgG (Poly4053), anti-CD3/allophycocyanin (HIT3a), anti-CD56/PE (HCD56), and mouse IgG1/FITC, IgG1/PE, or IgG1/allophycocyanin isotype control (MOPC-21) were purchased from BioLegend (San Diego, CA). Anti-CD107a/FITC (H4A3), anti-CD38, and anti-CD138 were purchased from BD Biosciences (San Jose, CA). SKO-007(J3), U266, and RPMI 8226 cells were cultured in 6-well tissue culture plates for 48 h at a concentration of 3 × 105 cells/ml in the presence of different concentrations of drugs. The expression of the NKG2D and DNAM-1 ligands on MM cells was analyzed by immunofluorescence staining using anti-MICA, anti-MICB, or anti-PVR/CD155-unconjugated mAb, followed by secondary goat anti-mouse allophycocyanin. In all experiments, cells were stained with propidium iodide (1 μg/ml) to assess cell viability. Nonspecific fluorescence was assessed by using an isotype-matched irrelevant mAb (R&D Systems), followed by the same secondary Ab. Fluorescence was analyzed using a FACSCalibur flow cytometer (BD Biosciences), and data were analyzed using FlowJo flow cytometric data analysis software (Tree Star, Ashland, OR). Total RNA was extracted using TRIzol (Life Technologies, Grand Island, NY), according to manufacturer’s instructions. The concentration and quality of the extracted total RNA were determined by measuring light absorbance at 260 nm (A260) and the ratio of A260/A280. Reverse transcription was carried out in a 25 μl reaction volume with 2 μg total RNA, according to the manufacturer’s protocol for Moloney murine leukemia virus reverse transcriptase (Promega, Madison, WI). Real-time PCR was performed using the ABI Prism 7900 Sequence Detection system (Applied Biosystems, Foster City, CA). cDNAs were amplified in triplicate with primers for MICA (Hs00792195_m1) conjugated with fluorochrome FAM and β-actin (4326315E) conjugated with fluorochrome VIC (Applied Biosystems). The level of ligand expression was measured using threshold cycle (Ct). The Ct was obtained by subtracting the Ct value of the gene of interest (MICA) from the housekeeping gene (β-actin) Ct value. In the current study, we used Ct of the untreated sample as the calibrator. The fold change was calculated according to equation 2−ΔΔCt, where ΔΔCt was the difference between Ct of the sample and the Ct of the calibrator (according to the formula, the value of the calibrator in each run is 1). The analysis was performed using SDS version 2.2 software (Applied Biosystems). NK cell–mediated cytotoxicity was evaluated using the lysosomal marker CD107a, as previously described (25). As source of effector cells, we used primary NK cells obtained from PBMCs isolated from healthy donors by Lymphoprep (Nycomed, Oslo, Norway) gradient centrifugation and then cocultured for 10 d with irradiated (30 Gy) EBV-transformed B cell line RPMI 8866 at 37°C in a humidified 5% CO2 atmosphere, as previously described (26). On day 10, the cell population was routinely >90% CD56+CD16+CD3−, as assessed by immunofluorescence and flow cytometry analysis. Drug-treated MM cell lines were incubated with activated NK cells at E:T ratio of 2.5:1, in a U-bottom 96-well tissue culture plate in complete medium at 37°C and 5% CO2 for 2 h. Thereafter, cells were washed with PBS and incubated with anti-CD107a/FITC (or cIgG/FITC) for 45 min at 4°C. Cells were then stained with anti-CD3/allophycocyanin, anti-CD56/PE to gate the CD3−CD56+ NK cell population. In some experiments, cells were pretreated for 20 min at room temperature with anti-NKG2D or anti–DNAM-1 neutralizing mAbs. Fluorescence was analyzed using a FACSCalibur flow cytometer (BD Biosciences), and data were analyzed using FlowJo flow cytometric data analysis software (Tree Star). A standard 4-h chromium-release assay was used, as previously described (27). SKO-007(J3) cells, stimulated as indicated in the text, were used as target cells and were labeled (100–200 μCi 51Cr/106 cells; Amersham BioSciences, Piscataway, NJ) for 90 min at 37°C and washed, and 5 × 103 cells/well were plated. As source of effector cells, we used primary NK cells, as described above. The percentage of specific lysis was calculated by counting an aliquot of supernatant and using the following formula: 100 × ([sample release − spontaneous release]/[total release − spontaneous release]). All determinations were made in triplicate, and E:T ratios ranged from 10:1 to 1:1, as indicated. The pBabe-S33Y-ER-puro retroviral vector encoding a chimeric β-catenin/estrogen receptor (ER) protein, in which the full-length S33Y/β-catenin (mutant β-catenin, codon 33 substitution of tyrosine for serine S33Y) is fused in-frame to a mutated ER ligand binding domain, was provided by E. Fearon (University of Michigan, Ann Arbor, MI). For knocking down β-catenin, we used a pLKO.1-sh-β-catenin lentivirus vector with puromycin resistance (TRCN0000003845, NM_001904.x-2279s1c1, MISSION; Sigma-Aldrich) and the control vector pLKO nontarget short hairpin RNA (shRNA). The vectors pSIREN-RetroQ (RQ) or pSIREN-RetroQ/HSF-1 (shRNA HSF-1) were provided by M. Sherman (Boston University Medical School, Boston, MA). Target sequence for HSF-1 shRNA was 5′-TATGGACTCCAACCTGGATAA-3′. The constitutively active mutant form of STAT3 (pBabe-STAT3-C, generated by inserting the STAT3-C cDNA into pBabe-Puro) was provided by J. Bromberg (Memorial Sloan-Kettering Cancer Center, New York, NY) (28). The pGL3-MICA-promoter vector was previously described (29) and given by J. Bui (University of California at San Diego, La Jolla, CA). For retrovirus production, Phoenix retrovirus packaging cell lines were cultured in DMEM plus 10% FCS. Phoenix cells were transfected with viral DNA (5 μg pBabe-S33Y-ER-puro, pBabe-Puro, or pBabe-STAT3-C) at 50% confluence with Lipofectamine Plus (Invitrogen, San Diego, CA). pLKO.1-sh-β-catenin and the control vector pLKO nontarget shRNA lentivirus were cotransfected together with the packaging vectors pVSVG and psPAX2 into 293 cells. After transfection, the cells were placed in fresh medium. After an additional 48-h culture, virus-containing supernatants were harvested, filtered, and used immediately for infections. Infections were performed on 0.5 × 106 SKO-007(J3) cells in 3 ml complete medium with Polybrene (8 μg/ml) (hexadimethrine bromide; Sigma-Aldrich) for 2 h. Postinfection, cells were allowed to expand for 24 h and were then selected for puromycin resistance. Amount of puromycin used during selection was 1 μg/ml. Transfections of SKO-007(J3) cells were carried out using a 4D-Nucleofector System (Lonza). To decrease variations in the experiments due to different transfection efficiency, cells were transfected in single batches that were then separated into different drug treatment groups. A pRL-CMV expression vector was cotransfected to normalize DNA uptake. After 3 h, cells were treated with LiCl, and, after additional 24 h, cells were harvested and protein extracts were prepared for the luciferase and Renilla assays. Protein concentration was quantified by the bicinchoninic acid method (Pierce, Rockford, IL). Luciferase and Renilla activity was read using the Dual-Luciferase Reporter Assay and the Glomax Multi Detection System (Promega) following the manufacturer’s instructions. For Western blot analysis, SKO-007(J3) cells were pelleted, washed once with cold PBS, resuspended in lysis buffer (1% Nonidet P-40 [v/v], 10% glycerol, 0.1% SDS, 0.5% sodium deoxycholate, 1 mM PMSF, 10 mM NaF, 1 mM Na3VO4, COMPLETE protease1 inhibitor mixture [Roche, Indianapolis, IN] in PBS), and subsequently incubated 30 min on ice. The lysate was centrifuged at 14,000 × g for 15 min at 4°C, and the supernatant was collected as whole-cell extract. Protein concentration was determined by the bicinchoninic acid method (Pierce). Thirty to 50 μg cell extract was run on 10% denaturing SDS-polyacrylamide gels. Proteins were then electroblotted onto nitrocellulose membranes (Schleicher & Schuell, Keene, NJ) and blocked in 3% milk in TBST buffer. Immunoreactive bands were visualized on the nitrocellulose membranes, using HRP-coupled goat anti-rabbit or goat anti-mouse Igs and the ECL detection system (GE Healthcare Amersham), following the manufacturer’s instructions. Abs against β-catenin, HSP-70, and β-actin were purchased from Santa Cruz Biotechnology (Santa Cruz, CA). Abs against phospho-STAT3 (Tyr705), STAT3, were purchased from Cell Signaling (Danvers, MA). The Ab anti-FLAG (clone M2) was purchased from Sigma-Aldrich. Densitometric analysis was performed using Quantity One software (Bio-Rad, Hercules, CA). SKO-007(J3) cells were processed for chromatin immunoprecipitation (ChIP) assays, following the Magna ChIP kit protocol from Upstate Biotechnology. After sonication, chromatin samples were immunoprecipitated overnight with 4 μg polyclonal rabbit anti-STAT3 Ab (Santa Cruz) or isotype control and 20 μl fully suspended protein A magnetic beads. The immunocomplexes/beads were washed sequentially with low-salt buffer, high-salt buffer, LiCl wash buffer, and TE buffer, as detailed in the Upstate Biotechnology protocol. Precipitations were extracted with an elution buffer (1% SDS/0.1 M NaHCO3) and digested with proteinase K for 2 h at 62°C. DNA was purified using spin columns and eluted in 30 μl diethyl pyrocarbonate–water. Fractions of precleared chromatin (1%) were processed similar to immunoprecipitated chromatin, for input DNA controls. The purified DNA was quantified in triplicate using real-time PCR, as described above, and the Power-SYBR Green mix with ROX (Applied Biosystems). Primer sequences were as follows: MICA promoter forward, 5′-GTGCGCGGTTGAGGGAGTGTG-3′; MICA promoter reverse, 5′-CCGCCCCATTAAACCGGCTCTC-3′. PCRs were validated by the presence of a single peak in the melt curve analysis, and amplification of a single specific product was further confirmed by electrophoresis on agarose gel. Results are expressed as relative enrichment as compared with the input. Negative control (no Ab) values were subtracted from the corresponding samples. Absolute quantifications were obtained by serial dilutions of the input DNA samples. The analysis was performed using the SDS version 2.2 software (Applied Biosystems). In the last few years, our laboratory has investigated the expression and regulation of NKG2D and DNAM-1 ligands on human MM cells in response to different antimyeloma agents able to activate the DNA damage response (melphalan, doxorubicin) (19) or to inhibit the HSP-90 chaperone (20). To characterize novel agents and pathways able to regulate the expression of these ligands in MM cells, we investigated the activity of different GSK3 inhibitors, a class of molecules recently studied for their ability to inhibit the proliferation of malignant lymphoid cells, including MM (21–23). To analyze the effect of GSK3 inhibition on the expression of NKG2D and DNAM-1 ligands, we initially performed a flow cytometric analysis on three MM cell lines [SKO-007(J3), U266, and RPMI 8226], after 48-h treatment with three classical inhibitors of GSK3, LiCl, SB21, or BIO, a specific inhibitor of GSK3, and relative of the cyclin-dependent kinase inhibitor indirubin-3′-monooxime (23). As shown in Fig. 1A and 1B (and Supplemental Figs. 1A, 1B, 2A, 2B for U266 and RPMI 8266 cells), treatment of SKO-007(J3) cells was able to upregulate the basal expression of MICA, with little or no effects on MICB or PVR levels (Supplemental Figs. 3A and 4 for U266 and RPMI 8266 cells). These treatments did not affect the cell viability over the time chosen for these experiments (as assessed by propidium iodide staining) (Supplemental Figs. 1C, 2C, 3B for U266 and RPMI 8266 cells) and the expression of MHCI on these cells (Supplemental Figs. 1D, 2D, 3C for U266 and RPMI 8266 cells). 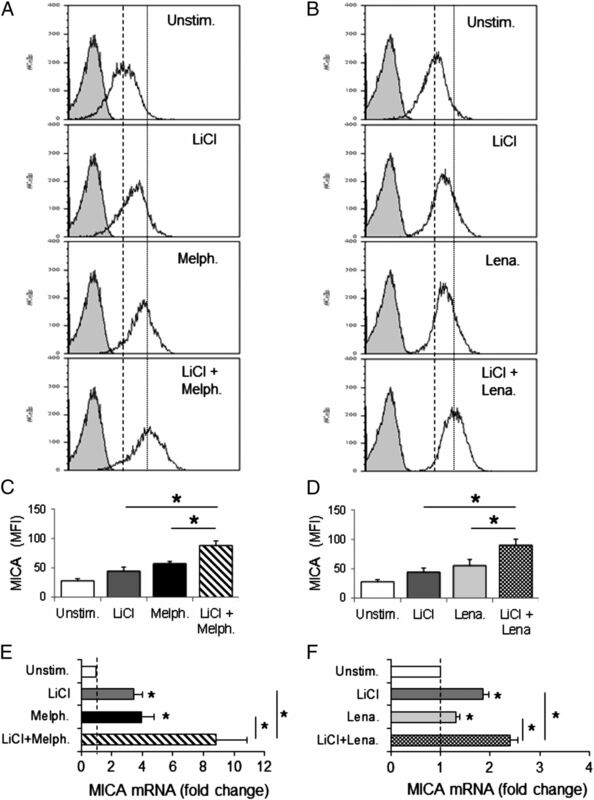 Previous observations have shown that these cell lines do not express detectable levels of UL16-binding proteins and nectin-2, and these ligands were not further analyzed in this study (20). We then examined whether a possible mechanism underlying MICA upregulation on MM cells could be the consequence of an increased mRNA expression. To this aim, total RNA was isolated from SKO-007(J3), U266, and RPMI 8226 cells exposed to these inhibitors for 24 h and analyzed by real-time quantitative RT-PCR. As shown in Fig. 1C (and Supplemental Figs. 1E, 2E for U266 and RPMI 8266 cells), we found a significant increase of MICA mRNA levels in treated cells. Moreover, we confirmed the effect of GSK3 inhibitors on the cell surface expression of MICA in four patient MM cells; as shown in Fig. 2A, increased expression of MICA was observed in LiCl-treated MM cells, with no significant effects on MICB or PVR levels (Fig. 2B, e.g., patient 4). Accordingly, similar results were obtained for MICA mRNA levels, in LiCl-treated MM cells from three additional patients (Fig. 2C). Upregulation of MICA expression on MM cells following treatment with GSK3 inhibitors. (A) MICA cell surface expression was analyzed by flow cytometry on SKO-007(J3) cells treated with the GSK3 inhibitors, LiCl (10 mM), SB21 (5 μM), or BIO (1.5 μM) for 48 h. The gray-colored histograms represent basal expression of MICA, whereas thick black-colored histograms represent the expression of MICA after treatment with the indicated inhibitor. Data are representative of one of four independent experiments. (B) The mean fluorescence intensity (MFI) of MICA was calculated based on at least four independent experiments and evaluated by paired Student t test (*p < 0.05). For each treatment, histograms represent the MFI with specific mAb-MFI with isotype control. (C) Real-time PCR analysis of total mRNA obtained from SKO-007(J3) cells, unstimulated or treated with the indicated GSK3 inhibitor for 24 h, as described above. Data, expressed as fold change units, were normalized with β-actin and referred to the untreated cells considered as calibrator and represent the mean of three experiments (*p < 0.05). Upregulation of MICA expression on patient MM cells following treatment with GSK3 inhibitors. (A) Cell surface expression of MICA was analyzed by flow cytometry on patient MM cells treated with LiCl (10 mM) for 48 h. The gray-colored histograms represent basal expression of MICA, whereas thick black-colored histograms represent the expression of MICA after treatment with LiCl. (B) MICA, MICB, and PVR/CD155 cell surface expression (arrows), representative of patient (P4), was analyzed by flow cytometry, as described above. (C) Real-time PCR analysis of total mRNA obtained from patient MM cells, unstimulated or treated with LiCl for 24 h, as described above. Data, expressed as fold change units, were normalized with β-actin and referred to the untreated cells considered as calibrator. These results indicate that inhibition of GSK3 activity enhances the cell surface expression and the mRNA levels of the NKG2D ligand MICA, in human MM cells. Because changes in the expression of NKG2D ligands (such as MICA) on tumor cells can modify the recognition and the activation of NK cells via NKG2D, we tested whether treatment of myeloma cells with GSK3 inhibitors could also lead to increased activation and NK cell–mediated killing. We analyzed the degranulation of NK cells isolated from healthy donors against SKO-007(J3) cells, by evaluating the expression of the CD107a [a surrogate marker for granule mobilization (25)], by immunofluorescence and FACS analysis. As shown in Fig. 3A and 3B, basal expression of CD107a on NK cells contacting SKO-007(J3) cells was enhanced following LiCl treatment. This increase of degranulation was significantly dependent on NKG2D activation, because considerably reduced in the presence of a blocking anti-NKG2D mAb; little changes of degranulation were observed upon treatment with an anti–DNAM-1 mAb or with a control mAb, this in accordance with our observation of the unmodified PVR surface expression in drug-treated cells. NKG2D-blocking Abs partially affected basal degranulation, indicating that constitutive NK cell degranulation also involves these activating receptors. We also analyzed the effect on the cytolytic function of enhanced MICA expression by GSK3 inhibition; standard cytotoxicity assays using 51Cr-labeled SKO-007(J3) target cells were performed, and, as shown in Fig. 3C, treatment with LiCl significantly increased specific killing when compared with the cytotoxicity of untreated cells. Our results, therefore, demonstrate that augmented expression of MICA in SKO-007(J3) cells treated with GSK3 inhibitors enhances NK cell activation and killing by promoting NKG2D recognition. Inhibition of GSK3 enhances NK cell–mediated cytotoxicity against myeloma cells. (A) NK cells prepared from PBMCs of healthy donors were incubated with SKO-007(J3) cells, untreated or treated with LiCl (10 mM) for 48 h, and used as target cells in a degranulation assay. The assay was performed at the E:T ratio of 2.5:1. After 3 h at 37°C, cells were stained with anti-CD56, anti-CD3, and anti-CD107a mAbs. Cell surface expression of CD107a was analyzed on CD56+CD3− cells. To evaluate the role of NKG2D and DNAM-1, the assay was performed in parallel, treating NK cells with blocking anti–DNAM-1 or anti-NKG2D Abs. Results are representative of one of three independent experiments. (B) The mean fluorescence intensity of CD107 was calculated based on at least three independent experiments and evaluated by paired Student t test (*p < 0.05). For each treatment, histograms represent the mean fluorescence intensity with specific mAb–mean fluorescence intensity with isotype control. (C) NK cells isolated from PBMCs of healthy donors were incubated with SKO-007(J3) cells, untreated or treated with LiCl for 48 h, as described above, and used as target cells in a standard 4-h chromium-release assay. The percentage of specific lysis was calculated by counting an aliquot of supernatant and using the following formula: 100 × ([sample release − spontaneous release]/[total release − spontaneous release]). All determinations were made in triplicate, and E:T ratios ranged from 10:1 to 1:1, as indicated. Data represent the mean (n = 4 experiments, *p < 0.05). To investigate whether one of the mechanisms involved in GSK3 inhibition-mediated increase of MICA expression could be a direct effect on the transcriptional activity of its promoter, transient transfection assays were performed in SKO-007(J3) cells. As shown in Fig. 4A, the activity of a luciferase reporter gene construct, containing 1 kb of the mica gene promoter region, was enhanced by LiCl. Thus, MICA mRNA expression and promoter activity are enhanced by GSK3 inhibition in MM cells. Inhibition of GSK3 enhances MICA expression: molecular mechanisms. (A) The mica promoter activity is enhanced by GSK3 inhibition in MM cells. SKO-007(J3) cells were cotransfected with 2 μg indicated luciferase reporter vector plus 0.5 μg pRL-CMV expression vector, as described in Materials and Methods. Three hours after transfection, cells were left untreated (−) or were stimulated with 10 mM LiCl for 24 h. Cells were then harvested, and protein extracts were prepared for the luciferase and Renilla assays. 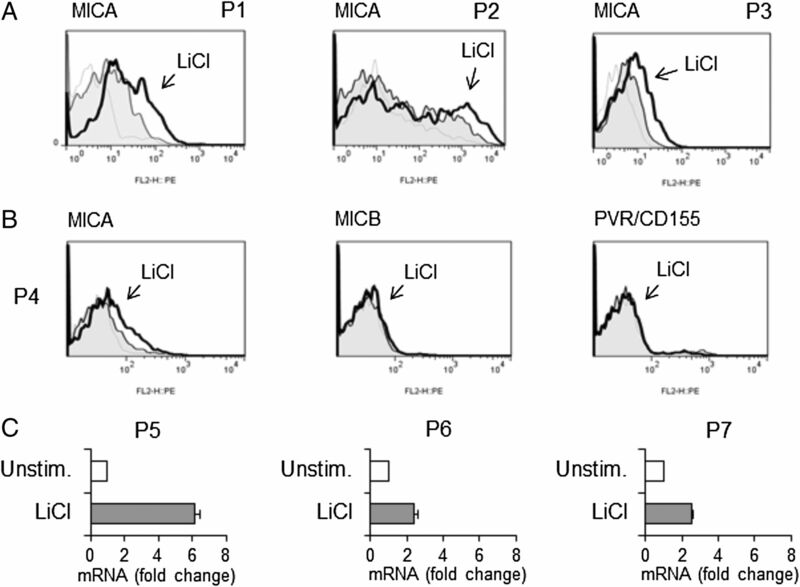 Results are expressed as relative luciferase activity normalized to protein concentration as well as to Renilla activity produced off the internal control plasmid and represent the mean value from four independent experiments (*p < 0.05). (B) SKO-007(J3) cells were treated with the indicated GSK3 inhibitors for 6 h, as described above, and cell lysates were immunoblotted for β-catenin and HSP-70. The proteins transferred to nitrocellulose membranes were stained with Ponceau to verify that similar amounts of protein had been loaded in each lane. Data are representative of one of three independent experiments. (C) Western blot analysis of total cellular proteins from SKO-007(J3) cells wild type or stably expressing an inducible chimeric β-catenin–ER fusion protein (SKO/S33Y-ER). The arrow indicates the expression of the β-catenin–ER fusion protein in stably transduced cells. The proteins transferred to nitrocellulose membranes were stained with Ponceau to verify that similar amounts of protein had been loaded in each lane. (D) MICA surface expression was analyzed by flow cytometry on SKO/S33Y-ER cells treated with 200 nM 4-OHT for 48 h. Data are representative of one of three independent experiments. The gray-colored histogram represents basal expression of MICA, whereas thick black-colored histogram represents the expression of MICA after treatment with 4-OHT. (E) Western blot was performed using whole-cell extracts from pLKO/nontarget shRNA control or pLKO-sh-β-catenin retrovirus-infected SKO-007(J3) cells, stimulated in the presence of LiCl. The proteins transferred to nitrocellulose membranes were stained with Ponceau to verify that similar amounts of protein had been loaded in each lane. (F) Surface expression of MICA was analyzed by flow cytometry on SKO-007(J3) nontarget shRNA or pLKO-sh-β-catenin cells, treated with LiCl, as described above. (G) MICA surface expression was analyzed by flow cytometry on RQ or shRNA HSF-1 retrovirus-infected SKO-007(J3) cells, treated with radicicol (1 μM) or LiCl, as described above, for 48 h. Data are representative of one of three independent experiments. GSK3 has been demonstrated to be a central integrator of many signaling pathways involved in a multitude of cellular physiological and pathological processes (1–3). In particular, GSK3 has been shown to posttranslationally modify degradation, nuclear export, and the activity of different transcription factors, via phosphorylation of consensus site-specific serine or threonine residues (30–32). To determine whether one of the mechanisms involved in GSK3 inhibition-mediated enhancement of mica gene expression could be related to its ability to regulate the function of specific transcription factors, we analyzed the role of β-catenin and HSF-1, two classical targets of this kinase and involved in regulating MICA expression in stressed cells (20, 33). Inhibition of GSK3 decreases phosphorylation of β-catenin, thus preventing its degradation by the ubiquitin-mediated pathway; the stabilized β-catenin acts in the nucleus by activating the T cell factor/lymphoid enhancer factor–mediated transcription of different target genes (34). As shown in Fig. 4B, treatment of SKO-007(J3) cells with LiCl, SB21, or BIO increased β-catenin protein levels, confirming GSK-3 inhibition in our experimental conditions. To investigate the possible link between the activity of this transcription factor and the induction of MICA expression, we used SKO-007(J3) cells stably expressing an inducible chimeric β-catenin/ER fusion protein (SKO/S33Y-ER), in which a full-length constitutive active (S33Y) β-catenin had been cloned upstream of a mutated ER ligand binding domain, capable of binding 4-hydroxytamoxifen (4-OHT), but not estrogen (35) (Fig. 4C). As shown in Fig. 4D, following 48-h treatment of the SKO/S33Y-ER cells with 4-OHT, no change in MICA expression was detected in these cells, indicating that accumulation and activation of β-catenin are not sufficient to induce MICA expression. 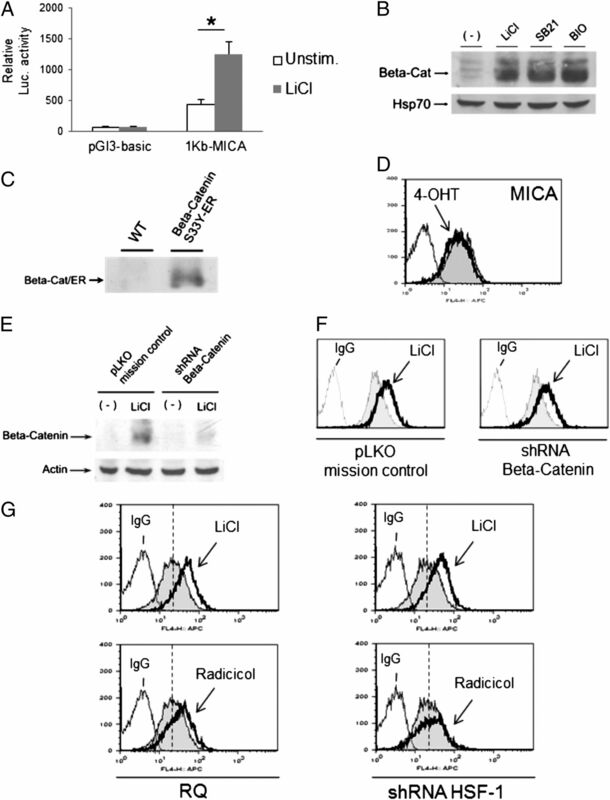 In addition, increased expression of MICA in the presence of LiCl was not affected in SKO-007(J3) cells in which β-catenin expression was blocked by shRNA interference (Fig. 4E, 4F). To investigate the involvement of HSF-1 in MICA upregulation by GSK3 inhibitors, we used SKO-007(J3) cells in which HSF-1 expression was blocked by shRNA interference, as already described (20). As previously reported, we observed that upregulation of MICA mediated by radicicol (a HSP-90 inhibitor able to activate HSF-1) was significantly blocked by HSF-1 interference; on the contrary, increased expression of MICA in the presence of LiCl was not affected in the same experimental setting (Fig. 4G). Recently, a novel role for the transcription factor STAT3 in the regulation of NKG2D ligands has been described; STAT3 inhibition is able to specifically upregulate MICA transcription and protein surface expression in a colorectal tumor cell line. As a result, this upregulation can enhance NKG2D-mediated NK cell activation and functions (24). Different pathways converge in regulating the activity of STAT3; in fact, in addition to being downstream of cytokine receptors, STAT3 is also activated by growth factor receptor and nonreceptor tyrosine kinases that phosphorylate and induce functional dimers able to translocate in the nucleus and to activate transcription [reviewed in (36)]. In this regard, GSK3 activity has been shown to positively influence the Tyr705 phosphorylation and DNA-binding activity of STAT3 in response to different cytokines, and inhibition of this kinase can significantly modulate the expression of STAT3-regulated genes (37). Thus, we investigated the possible correlation among GSK3 inhibition, enhancement of MICA expression, and modulation of the activity of STAT3 in MM cells. Fig. 5A shows that treatment of SKO-007(J3) cells with STA-21, a molecule able to inhibit STAT3 DNA binding, dimerization, and transcriptional activity (38), can increase the expression of MICA, thus confirming the repressive action of STAT3 on this gene in our experimental system. Similar results were obtained using the JAK2-specific inhibitor AG490, which predominantly represses STAT3 activity (Fig. 5B). Inhibition of GSK3 enhances MICA expression: role of STAT3. (A and B) MICA cell surface expression was analyzed by flow cytometry on SKO-007(J3) cells treated with the STAT3 inhibitor STA-21 (30 μM) or the JAK2 inhibitor AG490 (40 μM) for 48 h. The gray-colored histogram represents basal expression of MICA, whereas thick black-colored histogram represents the expression of MICA after treatment with STA-21 or AG490. Data are representative of one of three independent experiments. (C) SKO-007(J3) cells were treated with the indicated GSK3 inhibitors for 18 h, as described above, and cell lysates were immunoblotted for phospho-Tyr705-STAT3, total STAT3, and β-actin. The proteins transferred to nitrocellulose membranes were stained with Ponceau to verify that similar amounts of protein had been loaded in each lane. (D) The ratio of phospho-Tyr705-STAT3 to total STAT3 was calculated by densitometric analysis of the immunoblots. Data represent the mean (n = 3 experiments, *p < 0.05). (E) In vivo binding of STAT3 to the MICA promoter was examined using ChIP analysis. Samples were immunoprecipitated from sonicated lysates of SKO-007(J3) cells, unstimulated or treated for 18 h with the indicated inhibitor, as described above, using an Ab against human STAT3 protein or isotype control. After reversing the cross-linking, DNA was precipitated and real-time PCR was performed using primers to amplify the STAT3 promoter region encompassing the STAT3 responsive element (the MICA STAT3-RE is indicated in the box). Results are expressed as relative enrichment as compared with the input. Data represent the mean (n = 3 experiments, *p < 0.05). Interestingly, as already described in different models (5, 37, 39, 40), LiCl, SB21, and BIO could significantly reduce Tyr705 phosphorylation of STAT3 in SKO-007(J3) cells (Fig. 5C, 5D), suggesting that the constitutive Tyr705 phosphorylation of STAT3 in these cells was dependent on the GSK3 activity. To determine whether one of the mechanisms involved in the upregulation of MICA gene expression could be a direct regulatory action mediated by STAT3 on its promoter activity, quantitative ChIP assays were done on the promoter region encompassing the repressor element MICA/STAT3-RE (24). As shown in Fig. 5E, we observed that GSK3 inhibition can decrease the interaction of STAT3 on the MICA promoter; in addition, overexpression of a constitutively active mutant form of STAT3 [dimerized by cysteine–cysteine residues instead of pY-SH2 interactions (28)] significantly inhibited MICA upregulation (Fig. 6), indicating that specific repression mediated by active STAT3 on this gene can be released by GSK3 inhibition. 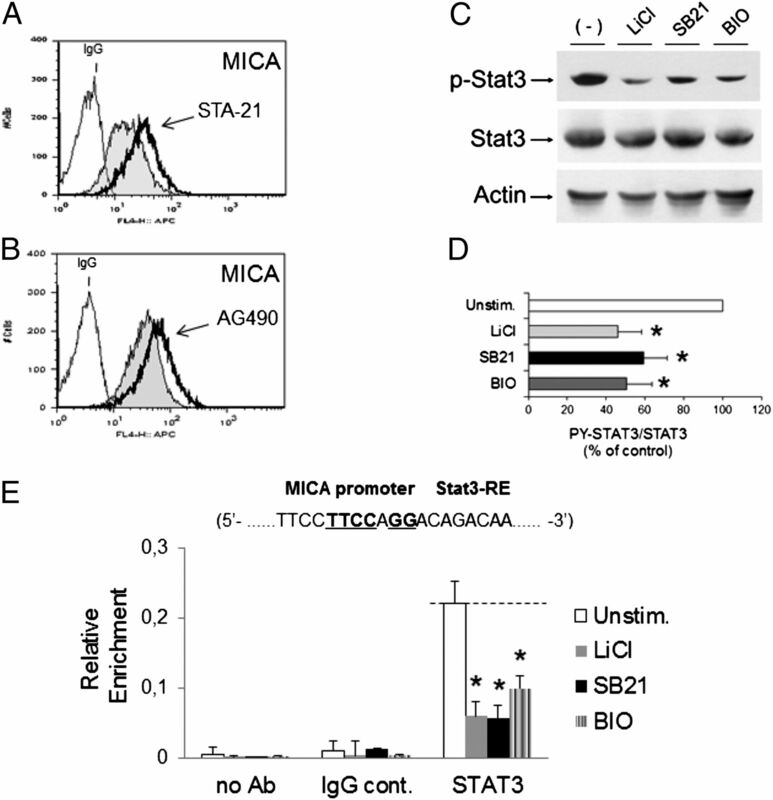 Constitutively active STAT3 inhibits MICA upregulation mediated by GSK3 inhibition. 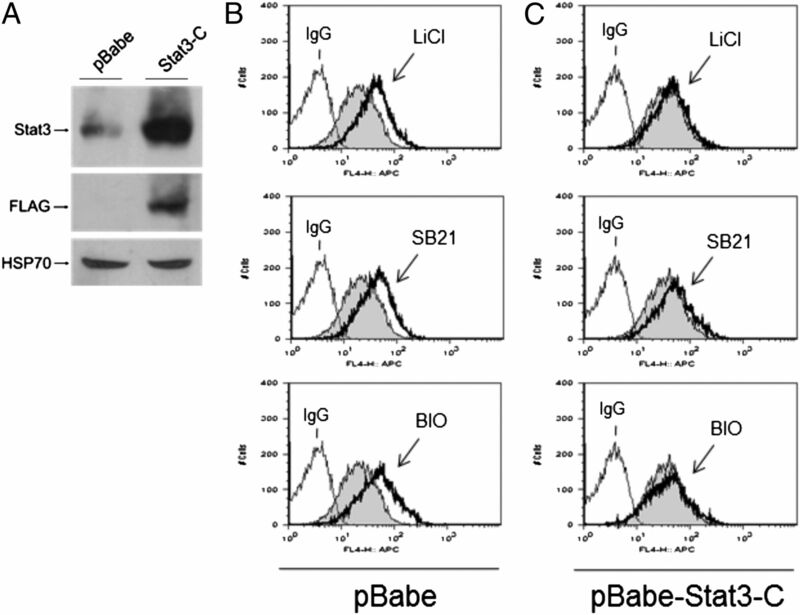 (A) Western blot analysis of total cellular proteins from SKO-007(J3) cells stably expressing a constitutively active mutant form of STAT3 (pBabe-STAT3-C). The proteins transferred to nitrocellulose membranes were stained with Ponceau to verify that similar amounts of protein had been loaded in each lane. (B and C) MICA cell surface expression was analyzed by flow cytometry on SKO-007(J3) cells transduced with empty pBabe-Puro or with a constitutively active mutant form of STAT3 (pBabe-STAT3-C). Cells were treated with the GSK3 inhibitors, LiCl (10 mM), SB21 (5 μM), or BIO (1.5 μM), for 48 h. The gray-colored histograms represent basal expression of MICA, whereas thick black-colored histograms represent the expression of MICA after treatment with the indicated inhibitor. Data are representative of one of three independent experiments. Activation of DDR is able to regulate the expression of NKG2D ligands in different tumor cells, playing an important role in immunosurveillance of transformed cells; in this regard, cancer drugs that target components of the DDR could improve current cancer therapies by activating cells of the innate immune system, such as NK cells (41). In this study, we investigated the possible cooperation between GSK3 inhibition and induction of MICA expression by DDR activation in MM cells. As previously described, treatment of SKO-007(J3) cells with melphalan increases the expression of MICA (19); interestingly, this upregulation was further enhanced in the presence of LiCl, both at the protein and mRNA expression (Fig. 7A, 7C, 7E), suggesting that GSK3 inhibition can cooperate with the DDR induced by genotoxic drugs to increase MICA expression by a mechanism that can involve removal of STAT3-mediated repression. Moreover, similar results were obtained using lenalidomide (Fig. 7B, 7D, 7F), an antimyeloma chemotherapeutic agent (derived using structural modifications of the chemical structure of thalidomide) endowed with antiangiogenic effects in the bone marrow and able to induce NK cell anti-MM immune responses (9, 13, 42). Inhibition of GSK3 enhances MICA expression in chemotherapy-treated cells. (A and B) MICA cell surface expression was analyzed by flow cytometry on SKO-007(J3) cells unstimulated, treated with LiCl, or in combination with melphalan (Melph.) (22 μM) or lenalidomide (Lena) (5 μM) for 48 h. The gray-colored histograms represent the isotype control Ab, whereas dashed lines represent the expression of MICA. Data are representative of one of three independent experiments. (C and D) The mean fluorescence intensity (MFI) of MICA was calculated based on at least three independent experiments and evaluated with a Student t test (*p < 0.05). For each treatment, histograms represent the MFI with specific mAb-MFI with isotype control. (E and F) Real-time PCR analysis of total mRNA obtained from SKO-007(J3) unstimulated, treated with LiCl, or in combination with melphalan or lenalidomide for 24 h. Data, expressed as fold change units, were normalized with β-actin and referred to the untreated cells considered as calibrator and represent the mean (n = 3 experiments, *p < 0.05). These results therefore indicate that GSK3 inhibitors can further enhance the expression of MICA in MM cells induced by standard chemotherapeutic drugs. In the last few years, increasing evidence has suggested that anticancer immune responses may contribute to the control of tumors after conventional chemotherapy; indeed, different observations have indicated that chemotherapeutic agents (e.g., genotoxic drugs) or radiotherapy can induce specific immune responses that result in immunogenic cancer cell death or immunostimulatory side effects (43, 44). An example of this functional connection between chemotherapy and therapeutical immunomodulation is the finding that several genotoxic agents or drugs, such as inhibitors of histone deacetylases or of the HSP-90 molecular chaperone, can increase the expression of NKG2D ligands, thus facilitating the activation of NKG2D-expressing lymphocytes (including NK cells, NKT cells, and CTLs) against tumor cells (19, 20, 41, 45, 46). GSK3 inhibitors are a class of molecules recently studied for their ability to induce apoptosis, to inhibit the proliferation, and to regulate the sensitivity of MM cells to clinically used chemotherapeutics, such as bortezomib (21–23). Moreover, given that effective inhibition of this kinase is necessary for canonical Wnt signaling and for osteogenic differentiation, GSK3 inhibitors are possible candidates for osteoinductive therapy in MM. Indeed, administration of the GSK3 inhibitor BIO in models of myeloma bone disease has been shown to ameliorate bone destruction associated with MM progression, enhancing the osteogenesis in mesenchymal stem cells and, in parallel, inducing regression of the tumor, adding novel information on the role of GSK3 on MM cell–tumor microenvironment interactions (23). GSK3 also has been characterized as an important regulator of many components of the immune response, suggesting the possibility to use drugs targeting its activity in inflammatory and autoimmune diseases [reviewed in (3, 5)]. As an example, GSK3 inhibition can reduce the production of several proinflammatory/osteolytic cytokines such as IL-1β, TNF, or IL-6 in monocytes/macrophages or inhibit the constitutive activity or the polarization of Th17 cells in different models of autoimmune disease (5, 47). Moreover, GSK3 has been shown to modulate specific functions of NK cells, given that inhibition of its activity can increase cytokine secretion and cytotoxicity, possibly due to nuclear translocation of functional β-catenin (48). In this study, we described the effect of different GSK3 inhibitors on the expression of the NKG2D and DNAM-1 ligands in human MM cells. We found that treatment of different MM cell lines with GSK3 inhibitors is able to increase the expression of the NKG2D ligand MICA, rendering these cells more susceptible to NK cell–mediated killing (Fig. 3). In this regard, our observations provide the additional information that pharmacological modulation of this kinase could potentiate the activity of NK cells against the tumor, via mechanisms that can involve a parallel action on NK cells and tumor cells, increasing the expression of ligands that promote recognition and enhancing the cytolytic activity of the effectors (48). Interestingly, a pivotal role in this regulatory mechanism is mediated by the effect of GSK3 on STAT3 activation, a transcription factor recently described to specifically inhibit MICA gene expression in different cancer cell lines, via direct repression of its promoter activity (24). Moreover, STAT3 can be persistently activated in different types of human cancers, including MM, where it plays critical roles in the process of carcinogenesis and tumor survival (36, 49, 50), also sustaining local tumor-promoting stromal inflammation (51). GSK3 activity has been shown to positively influence the Tyr705 phosphorylation and DNA-binding activity of STAT3, and inhibition of this kinase can strongly suppress the activating phosphorylation of STAT3 on Tyr705 and significantly modulate the expression of STAT3-regulated genes (5, 37, 39, 40, 47). Our data show that inhibition of GSK3 activity can decrease the constitutive Tyr705 phosphorylation of STAT3 in SKO-007(J3) cells; in this context, treatment of SKO-007(J3) cells with the STAT3 inhibitor STA-21 or with the JAK2-specific inhibitor AG490 (that predominantly repress STAT3 activity) can increase the expression of MICA, thus confirming the repressive action of STAT3 on this gene in our experimental system. GSK3 inhibition can increase the transcriptional activity of the mica gene promoter (Fig. 4A) and reduce the interaction with STAT3, as revealed by quantitative ChIP assays on the promoter fragment encompassing the repressive MICA/STAT3-RE (24) (Fig. 5E). Moreover, overexpression of a constitutively active mutant form of STAT3 significantly inhibited MICA upregulation (Fig. 6), indicating that one of the mechanisms involved in GSK3-mediated regulation of mica gene expression could be related to the transcriptional activity of its promoter, where basal repression mediated by active STAT3 can be released by GSK3 inhibition. At this regard, we could exclude that increased expression of β-catenin or the activation of HSF-1 (transcription factors specifically inhibited by active GSK3) is involved in the upregulation of MICA expression, by using RNA interference or viral transduction of constitutive active forms (Fig. 4C–G). We also investigated the possible cooperation between GSK3 inhibition and induction of MICA expression in chemotherapy-treated MM cells. As already described (19, 20), melphalan increased the expression of MICA in SKO-007(J3) cells, and this upregulation was further enhanced in the presence of LiCl, suggesting that GSK3 inhibition can cooperate with genotoxic drugs to increase MICA expression (Fig. 7). Interestingly, STAT3 constitutive activation was shown to prevent the induction of MICA following genotoxic stress (24). These observations suggest that constitutive activation of this transcription factor in MM cells may interfere with pathways triggered by DDR; thus, GSK3 inhibition may favor MICA upregulation after melphalan treatment by reducing the repressive activity of STAT3. Finally, similar results were obtained using lenalidomide (Fig. 7), an antiangiogenic and antimyeloma molecule able to induce NK cell immune responses, and recently described to upregulate MICA in MM cells (52); however, the molecular mechanisms mediating these effects are unknown. STAT3 is a positive regulator of the transcription of different genes; however, it can also act as a transcriptional repressor, as already described for the IL-8 and p53 genes. In this case, a direct binding of STAT3 to the IL-8 and p53 promoters was required for inhibition (53, 54). Further studies will be necessary to better clarify the transcriptional mechanisms involved in MICA upregulation mediated by GSK3/STAT3 inhibition, and to identify and dissect novel pharmacological cooperation with other modulators of NKG2D ligand expression to enhance NK cell activity against the tumor. In conclusion, this study provides novel information about the therapeutic potential of GSK3 inhibition in MM; promotion of tumor immunosurveillance via enhancement of the NKG2D-ligand MICA expression could be considered an additional mechanism supporting the antimyeloma activity of GSK3 inhibitors and suggests their possible immunotherapeutic value. We thank Dr. Eric R. Fearon (University of Michigan, Ann Arbor, MI) for providing the retroviral vector pBabe-S33Y-ER-puro; Dr. J.F. Bromberg (Memorial Sloan-Kettering Cancer Center) for the constitutively active mutant form of STAT3, pBabe-STAT3-C; Dr. M.Y. Sherman (Boston University Medical School) for the vectors pSIREN-RetroQ (RQ) and pSIREN-RetroQ/HSF-1 (shRNA HSF-1); and Dr. Jack D. Bui (University of California at San Diego) for the pGL3-MICA-promoter vector. This work was supported by grants from the Italian Association for Cancer Research, 5x1000 AIRC, Ministero della Salute, Ateneo, Ministero dell'Istruzione dell'Università e della Ricerca (PRIN/2010NECHBX_004/Marco Cippitelli).
. 2003. GSK-3: tricks of the trade for a multi-tasking kinase. J. Cell Sci. 116: 1175–1186.
. 2006. Glycogen synthase kinase-3: an overview of an over-achieving protein kinase. Curr. Drug Targets 7: 1377–1388.
. 2011. Glycogen synthase kinase 3: a point of convergence for the host inflammatory response. Cytokine 53: 130–140.
. 2004. GSK3 inhibitors: development and therapeutic potential. Nat. Rev. Drug Discov. 3: 479–487. 2009. Glycogen synthase kinase 3beta (GSK3beta) in tumorigenesis and cancer chemotherapy. Cancer Lett. 273: 194–200.
. 2008. Multiple myeloma. Blood 111: 2962–2972.
. 2012. Latest advances and current challenges in the treatment of multiple myeloma. Nat. Rev. Clin. Oncol. 9: 135–143.
. 2012. Treatment strategies in relapsed and refractory multiple myeloma: a focus on drug sequencing and ‘retreatment’ approaches in the era of novel agents. Leukemia 26: 73–85.
. 1996. Graft-versus-myeloma effect: proof of principle. Blood 87: 1196–1198.
. 2007. A comparison of allografting with autografting for newly diagnosed myeloma. N. Engl. J. Med. 356: 1110–1120.
. 2002. Anti-myeloma activity of natural killer lymphocytes. Br. J. Haematol. 119: 660–664.
. 2005. Molecular mechanisms whereby immunomodulatory drugs activate natural killer cells: clinical application. Br. J. Haematol. 128: 192–203.
. 2002. NK inhibitory-receptor blockade for purging of leukemia: effects on hematopoietic reconstitution. Biol. Blood Marrow Transplant. 8: 17–25.
. 2005. HLA class I, NKG2D, and natural cytotoxicity receptors regulate multiple myeloma cell recognition by natural killer cells. Blood 105: 251–258.
. 2007. The requirement for DNAM-1, NKG2D, and NKp46 in the natural killer cell-mediated killing of myeloma cells. Cancer Res. 67: 8444–8449.
. 2008. MHC class I chain-related protein A antibodies and shedding are associated with the progression of multiple myeloma. Proc. Natl. Acad. Sci. USA 105: 1285–1290.
. 2005. MICA expressed by multiple myeloma and monoclonal gammopathy of undetermined significance plasma cells costimulates pamidronate-activated gammadelta lymphocytes. Cancer Res. 65: 7502–7508.
. 2009. Heat shock protein-90 inhibitors increase MHC class I-related chain A and B ligand expression on multiple myeloma cells and their ability to trigger NK cell degranulation. J. Immunol. 183: 4385–4394.
. 2008. Growth control of multiple myeloma cells through inhibition of glycogen synthase kinase-3. Leuk. Lymphoma 49: 1945–1953.
. 2010. Glycogen synthase kinase-3 regulates multiple myeloma cell growth and bortezomib-induced cell death. BMC Cancer 10: 526.
. 2011. Pharmaceutical inhibition of glycogen synthetase kinase-3β reduces multiple myeloma-induced bone disease in a novel murine plasmacytoma xenograft model. Blood 117: 1641–1651.
. 2011. Novel role for STAT3 in transcriptional regulation of NK immune cell targeting receptor MICA on cancer cells. Cancer Res. 71: 1615–1626.
. 2005. Cytolytic granule polarization and degranulation controlled by different receptors in resting NK cells. J. Exp. Med. 202: 1001–1012.
. 2000. RAC1/P38 MAPK signaling pathway controls beta1 integrin-induced interleukin-8 production in human natural killer cells. Immunity 12: 7–16.
. 2002. Negative regulation of CD95 ligand gene expression by vitamin D3 in T lymphocytes. J. Immunol. 168: 1154–1166.
. 2004. Requirement of matrix metalloproteinase-9 for the transformation of human mammary epithelial cells by Stat3-C. Proc. Natl. Acad. Sci. USA 101: 10602–10607.
. 2009. Cutting edge: down-regulation of MHC class I-related chain A on tumor cells by IFN-gamma-induced microRNA. J. Immunol. 182: 39–43.
. 1998. Glycogen synthase kinase 3beta and extracellular signal-regulated kinase inactivate heat shock transcription factor 1 by facilitating the disappearance of transcriptionally active granules after heat shock. Mol. Cell. Biol. 18: 6624–6633.
. 1997. Nuclear export of NF-ATc enhanced by glycogen synthase kinase-3. Science 275: 1930–1934.
. 2000. Requirement for glycogen synthase kinase-3beta in cell survival and NF-kappaB activation. Nature 406: 86–90.
. 2007. Promoter region architecture and transcriptional regulation of the genes for the MHC class I-related chain A and B ligands of NKG2D. J. Immunol. 178: 961–969.
. 1996. Binding of GSK3beta to the APC-beta-catenin complex and regulation of complex assembly. Science 272: 1023–1026.
. 1995. A modified oestrogen receptor ligand-binding domain as an improved switch for the regulation of heterologous proteins. Nucleic Acids Res. 23: 1686–1690.
. 2009. STATs in cancer inflammation and immunity: a leading role for STAT3. Nat. Rev. Cancer 9: 798–809.
. 2008. Differential regulation of STAT family members by glycogen synthase kinase-3. J. Biol. Chem. 283: 21934–21944.
. 2005. A low-molecular-weight compound discovered through virtual database screening inhibits Stat3 function in breast cancer cells. Proc. Natl. Acad. Sci. USA 102: 4700–4705.
. 2009. Lipopolysaccharide-induced interleukin-6 production is controlled by glycogen synthase kinase-3 and STAT3 in the brain. J. Neuroinflammation 6: 9.
. 2009. Glycogen synthase kinase-3 promotes the synergistic action of interferon-gamma on lipopolysaccharide-induced IL-6 production in RAW264.7 cells. Cell. Signal. 21: 978–985. 2007. DNA damage response and development of targeted cancer treatments. Ann. Med. 39: 457–464.
. 2010. Lenalidomide mode of action: linking bench and clinical findings. Blood Rev. 24(Suppl. 1): S13–S19.
. 2008. Tumor stress, cell death and the ensuing immune response. Cell Death Differ. 15: 21–28.
. 2008. The anticancer immune response: indispensable for therapeutic success? J. Clin. Invest. 118: 1991–2001.
. 2005. Natural killer cell-mediated lysis of hepatoma cells via specific induction of NKG2D ligands by the histone deacetylase inhibitor sodium valproate. Cancer Res. 65: 6321–6329.
. 2012. Valproic acid upregulates NKG2D ligand expression through an ERK-dependent mechanism and potentially enhances NK cell-mediated lysis of myeloma. Neoplasia 14: 1178–1189.
. 2011. Glycogen synthase kinase-3 is an early determinant in the differentiation of pathogenic Th17 cells. J. Immunol. 186: 1391–1398.
. 2005. Role for glycogen synthase kinase-3 in NK cell cytotoxicity and X-linked lymphoproliferative disease. J. Immunol. 174: 4551–4558.
. 2004. Genome-wide analysis of STAT target genes: elucidating the mechanism of STAT-mediated oncogenesis. Cancer Biol. Ther. 3: 1045–1050.
. 2003. STAT proteins: from normal control of cellular events to tumorigenesis. J. Cell. Physiol. 197: 157–168.
. 1999. Constitutive activation of Stat3 signaling confers resistance to apoptosis in human U266 myeloma cells. Immunity 10: 105–115.
. 2011. IPH2101, a novel anti-inhibitory KIR antibody, and lenalidomide combine to enhance the natural killer cell versus multiple myeloma effect. Blood 118: 6387–6391.
. 2008. Deregulation of a STAT3-interleukin 8 signaling pathway promotes human glioblastoma cell proliferation and invasiveness. J. Neurosci. 28: 5870–5878.
. 2005. Role of Stat3 in regulating p53 expression and function. Mol. Cell. Biol. 25: 7432–7440.